Construction of the resort was subject to strict regulations to safeguard the environment and the preservation and protection of the island’s unique flora and fauna continues to be amongst Fregate’s main priorities. With no more than 40 guests at any one time, guests are invited to experience the rare treat of luxury, security and seclusion within the natural beauty of a tropical island setting. The island remains exclusive to its guests – no day visitors are allowed – with each villa positioned to ensure ultimate privacy. 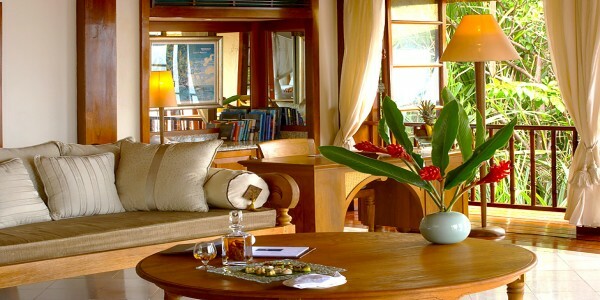 The villas are built of native mahogany and blend harmoniously into the natural surroundings. The tropical feel of the buildings is deliberately casual. Each villa has a large terrace with a day bed and jacuzzi as an extension of the living area. The light and spacious interior houses colonial-style furniture and state-of-the-art technology. The Rock Spa is a haven of serenity, perched on a cliff-top plateau overlooking the sea. Entered through a granite canyon, flanked by freshwater pools and cascading waterfalls, the spa celebrates the island’s unique surroundings and embraces all elements of nature. The finest holistic treatments from all over the world use ancient techniques from India, Australia and Polynesia with botanical treatments prepared from local ingredients. Afterwards, relax with a glass of cool coconut milk, champagne or tea with fresh lemongrass and enjoy the view from the spa’s sublime vantage point high above the Indian Ocean. With an enticing plethora of recreational and sporting activities,Frégate Island Private is a natural playground for absorbing the natural vitality of the Seychelles and energising the mind, body and soul. Right beside the spa, the Rock Gym with its wonderful views into greens and rock formations offers fitness equipment from dumb-bells to multifunctional gym systems. Facilities also include a full size, hard surface tennis court; a grass volleyball/badminton court; paved mountain biking/jogging tracks; and boccia ball; while beginner and advanced yoga classes are also available. Sports equipment and facilities are provided for guests free of charge. Weaving through the tropical jungle interior and along the sweeping, idyllic island coastline via numerous sun-dappled walking paths and nature trails, guests can explore the abundant beauty of Frégate Island Private either at their own pace or accompanied by one of our ecologists, and interact with its spectacular living athenaeum of flora and fauna: a modern day Noah’s Ark. Savour a spellbinding panorama of paradise upon Mont Signal, an imposing 125-metre granite peak… Behold the sight of the island’s most famous inhabitant, the Seychelles-Shama Thrush, commonly called the Magpie Robin… Listen to the glorious musical improvisations of the Seychelles Blue Pigeon. Safari through lush forests of extraordinary Coco der Mer palms and giant Banyan trees. Encounter magnificent Aldabra giant tortoises, roaming the dense undergrowth and swampy terrain; the unique tenebrionid beetle, only found on Frégate’s soil; and the Seychelles terrapin. Experience an ocean of kaleidoscopic colours on, in and under the glistening waters, with Frégate Island Private’s own marina and fleet of boats, including kayaks, sailing dinghies, catamarans and motor yachts. Skim across tranquil turquoise lagoons aboard a hobie cat or kayak, ride the lapping Seychellois waves windsurfing, and discover a dazzling array of underwater wonders snorkelling in mesmerising aquatic realm. For younger children there is an Optimist dinghy, ideally suited for ‘learning the ropes’ in the safety of the marina basin. Fully PADI certified scuba diving excursions are available for deeper exploration of the vibrant marine life living in an oasis of coral reefs. Frégate Island Private’s Dive Centre offers various diving courses and certifications, with numerous dive sites suiting all levels of diver, from beginner through to experienced. By the harbour’s edge, the newly renovated Yacht Club – with its intimate bar, billiard table, terrace and hammocks – is the perfect place to unwind after an invigorating day on the water. The bar is open into the evening, offering home-spiced rum specialities and BBQ events on request. From the comfort of one of Frégate Island’s stylish, fully equipped fishing vessels, both expert and novice fishermen can enjoy the excitement of deep-sea fishing in one of the world’s richest fishing grounds. Reel in yellow-fin tuna, dorado, wahoo, sailfish, marlin, and even billfish. On return to the island, the chefs will create a gastronomic delight prepared specially with the catch of the day; the perfect dining experience by which to enjoy Frégate Island Private’s bounty. The Castaway Club is for children between 5 to 12 years of age. 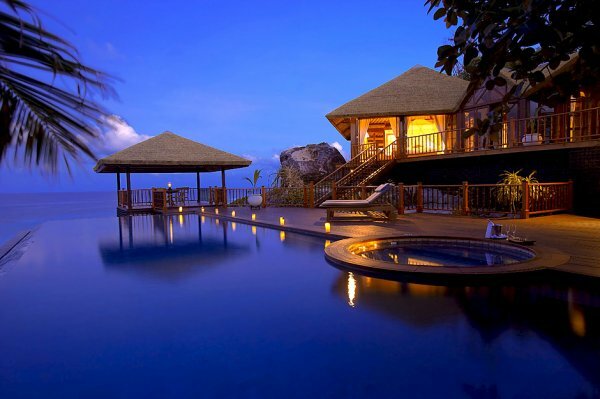 The Castaway Clubhouse is the meeting place for Fregate Island’s Castaway kids. Importantly, it is a platform to educate and teach the kids (and parents) about the environment and conservation of our natural heritage. This is a rustic structure above Fregate House, and it’s from here that all the activities will be co-ordinated. The clubhouse offers games, videos, craft material, books and much more. Frégate Island Private has just 16 villas and one Presidential Villa, accommodating only a selected number of guests at any one time and thereby ensuring the island remains exclusively the realm of its guests – no day visitors are allowed. Positioned to guarantee ultimate privacy, each villa is built of native mahogany and clad in rich African Chamfuta Teak wood, blending harmoniously into its natural surroundings. The typical villa plan features square spaces rotated 45 degrees, maximising views of the ocean through two facades. The tropical feel of the buildings is intentionally casual, in keeping with the surroundings; in addition to an indulgent private infinity pool, each villa features a large terrace – with day bed and Jacuzzi – which flows from the interior as part of an extended living area. Interior architecture is simple and elegant. The post and lintel structure is mirrored inside, framing picture-perfect views of the island; African Chamfuta Teak skirting boards edge cream Botticino marble floors, while vaulted roofs and Merbou timber framework faithfully reflect a diverse colonial architectural heritage. Frégate Island Private introduced a comprehensive butler concept; a private butler is assigned to each villa to assure personalised and individual services throughout the guest’s stay, providing anything, anytime, anywhere on the island. *3 separate sleeping villas each for 2 persons (approx. 70 sqm) are located along the cliff with a *veranda, own bathroom, TV, CD / DVD Player and Minibar. *per sleeping villa one extra bed for a child can be added. *a chef and dedicated butlers will take care of the guest’s wishes. In keeping with its committed approach to ecological issues, Frégate Island Private continues to strengthen the connection between restaurant menus and island-grown produce. Influenced by the abundance and diversity of ingredients cultivated on Frégate Island, the executive chef takes guests to new gastronomic heights with innovative demonstrations of the extraordinary flavours that nature can deliver. His inspired recipes are the expression of a distinctive culinary style applied to the freshest seasonal produce, ensuring every dish is unique in character and flavour and a true reflection of the bountiful tropical setting in which it is enjoyed; the island’s own plantation and hydroponics house ensure guests can enjoy fresh fruit and vegetables every day. The gourmet menu at Frégate House features the Chef’s daily selection of local produce, with dining available both in the restaurant and on the lower terrace. Every evening the Plantation House – a museum by day – transforms into a romantic restaurant serving traditional Creole dishes and island specialities. This historical building evokes the island’s heritage and is a wonderful venue for al fresco dining. In addition to the restaurants and bars, guests can enjoy bespoke dining experiences anywhere on the island – Frégate is their oyster! Dinner in the Tree House, serenaded by birdsong… barbecues on the beach or at the Yacht Club… private candlelight dinners in the privacy of their villa… or a favourite setting of their own discovery. Frégate Island Private also boasts a wine cellar comparable with the world’s most famous, cosmopolitan hotel restaurants, with a selection of over 300 wines including some of the most sought-after labels, varietals and vineyards from around the globe. As well as hosting regular wine tastings, the cellar is an intimate and unusual dining venue for groups of up to 10 guests. The Pirate’s Bar, overlooking Anse Bambous, and the Anse Bambous Beach Bar also offer light snacks and drinks at lunch and dinner.